1. When should one remove the plastic film covering the mezuzah parchment? Only for inspection. There is nothing wrong with keeping it covered and it is even beneficial to do so. 2. Can a mezuzah be ordered and sent through the mails? Yes, it can. It is advisable to double wrap it and to specify “fragile” on the outer envelope to receive the special attention reserved for a sacred article. 3. I am usually satisfied with regular kosher and do not require special kosher, why then should I prefer a special kosher mezuzah? Are there different levels of excellence? How is this manifested? There is a very significant difference. 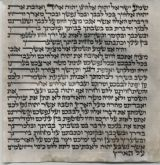 Regular kosher writing is hasty and sometimes sloppy and many of the letters are incomplete or look strange. 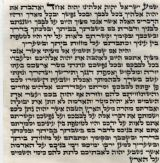 On the other hand, a mezuza that is classified as mehuderet (special kosher) is uniformly written, pleasing to the eye and the effect is dignified as befits an article of kedusha (sanctity). There are many levels of hiddur (special kosher) and prices differ accordingly. 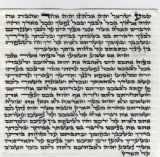 Levels may be a result of the sofer’s experience and/ or his devotion (as specified in the kabbala), etc., but it is wise not to compromise, to obtain at least the basic special kosher- halachically kosher writing to begin with. In other words, attention is paid to all the halachic details regarding the shape of the letters. 4. I am a single woman, do I need a man to put up the mezuzah in my home? The obligation is on the woman as well as on a man, therefore, a woman can and should make the bracha (blessing) and may put up the mezuzah herself. 5 .What is the blessing for the mezuzah? Barukh atah Hashem elokeinu melekh ha'olam, asher qid'shanu b'mitz'votav vitziuanu liq'boa mezuzah. Blessed are You, L-rd our G-d, King of the Universe, Who sanctified us with His mitzvot, and commanded us to affix a mezuza. If one is making the blessing not in his own home, the version is modified to “al keviyat mezuzah”. 6. How does one affix a mezuzah? The parchment is rolled tightly from the end to the beginning of the written lines- left to right, wrapped in thin plastic and placed in a case which is then affixed to the doorpost. In other words, it is attached to the post with nails or glue. 7. Where does one place a mezuzah? At the right of the entrance from the point of view of one entering the building or room at a height 2/3 up from the average threshold. In any case, it must be higher than 1.5 yards. 8. In a room that serves as a passageway to other rooms and has several openings, where should I place the mezuzah? Bear in mind the point of view of one entering the room for principal use of these doorways. 9. Does the opening to a terrace require a mezuzah? Yes, and if the terrace has a roof, there are those who say that it is likened to a room and the mezuzah should be placed to the right when one steps out to the terrace and there are those that say that the entrance from the terrace requires a mezuzah as any outer entrance. This means that the mezuzah in this case should be to the right when one enters the house from the terrace. In any case, if the terrace is not covered, then the opinion holds that the mezuzah should be to the right for someone who is going into the house from the terrace. 10. Does a small room require a mezuzah? A room smaller than 4.8 square yards does not require a mezuzah. A long narrow room not even 2.2 yards wide requires a mezuzah but no bracha (blessing) is said. 11. If one wishes to exaggerate and place a mezuzah where it is not required, can this be done? Is it prohibited to do so? If the room is not used for something soiled or does not emit a bad smell, it is allowed, but without saying the bracha. 12. Do bathrooms and toilets require a mezuzah? These rooms are prohibited from having a mezuzah because it is disrespectful. 13. 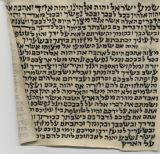 How is the mezuzah parchment rolled? From the end left to right and inward. One can use a skewer for help in winding, then wrap in thin cling film. A mezuzah may not be affixed lying flat open. 14. Do offices, stores, and businesses require a mezuzah? The letter of the law requires a mezuzah on one’s home, a place one sleeps as it says “u-v'shawch-b'cha uv-ku-me-cha” (and when you lie down, and when you rise). Yet, in rooms that are occupied for many hours, one must affix a mezuzah. 15. Is an inexpensive regular kosher mezuzah on these establishments allowed? There is this option, since the principal requirement is placing a mezuzah where one sleeps, however one must be positive that the mezuzah has been duly inspected. 16. Some months I glued a mezuzah on to a metal doorpost, and now I find that it has fallen off. This means that poor quality glue was used. 17. When should one check the mezuzah? Is there a difference between the first examination and subsequent periodic examinations? The halacha (Jewish law) says that one should check his mezuzahs twice in a seven year span. Today one can be safe with less frequent checks because the parchments are protected by plastic and good quality cases. In any case when one enters a new home that already has mezuzot of unknown quality; it is advisable to have them inspected. Good to know: the first inspection is unlike periodic inspections. Periodic inspection can be done independently, its sole purpose to assure that the ink has not faded. This can be done by anybody. Primary inspection must be performed by a qualified experienced proofreader. He examines each and every letter and tag, to assure that they have been properly written. Only someone certified in this profession may perform this inspection. 18. How come we keep hearing that many mezuzot have been invalidated upon inspection? Most of these mezuzot were never kosher to begin with. Unfortunately, there are mezuzot on the market that were never checked and they are unacceptable. Mezuzot that have been duly checked keep well if they have not absorbed humidity. 19. Does temporary housing require a mezuzah? Temporary housing such as a tent etc. does not require a mezuzah. When one is a guest in a hotel, it is considered a temporary residence and a mezuzah is not required. But the owner of the hotel, if Jewish, is required to place mezuzot on all hotel doorways. 20. Is there any importance attached to the shape of the mezuzah case and the material it is made of? It makes no difference what shape the case is, as long as the parchment fits in easily. A mezuzah that is exposed to sun and rain should be in a watertight case. 21. I have seen cases with the letter “shin” on the outside. What does this mean? “shin” is the initial of one of Hashem’s (G-d’s) names. Shin dalet yud. It is customary to write these letters on the back of the mezuzah parchment itself. There is no obligation to write a “shin” on the mezuzah case. 22. Where and how do I affix the mezuzah and at what height? The parchment of the mezuzah will stand upright or at a slant with the top pointing into the room. It is customary to place the mezuzah 2/3 way up the height of the doorpost, the approximate height of an average man. 23. Is an opening without a horizontal lintel required to have a mezuzah? No. The definition of an entrance requiring a mezuzah, comprises a horizontal lintel. If there is not even the slightest hint of this, then the mezuzah is not required. 24. Does an entrance that does not have a door require a mezuzah? There are differing opinions between the authorities here. Therefore one can affix a mezuzah in this case, without a bracha. In any case, a less expensive mezuzah can be used here. 25. Does a rarely or never used doorway require a mezuzah? As long as the door exists and is potentially functional, it is considered an opening and requires a mezuzah. 26. What is preferable, a small or a large mezuzah? What’s the difference? A 4” mezuzah allows for nicer writing and tags to match. It is difficult to do such precise work on a smaller parchment so a kosher small mezuzah will be more expensive than its larger counterpart. 27. What’s it to me if the mezuzah was written in Ashkenazi or Sephardic style? Everything is kosher if it has been properly examined, but there is a rule that says “Shema beni mussar avicha, vi-al titosh toras imecha” (Listen, my child, to the tradition of your father, and do not neglect the Torah of your mother.) 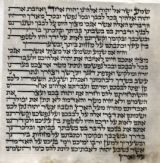 Therefore one is required to follow the father’s custom, Sephardic writing for an Ashkenazi is kosher, but only after the fact. 28. Does every sofer STAM know how to inspect mezuzot? No. We recommend taking your mezuzahs for inspection by a certified proofreader. A certified proofreader is proficient in these halachic laws. 29. Does a tenant have to affix a mezuzah? 30. If one moves, can he take the mezuzot with him? Yes, and no. If one leaves his previous home, even if it was a rental, he must leave the mezuzot intact. But, he can switch them with other cheaper kosher mezuzot and then he can take his more expensive ones with him. 31. Can one demand money from the tenant or the new buyer for the mezuzot? According to the Ashkenazi authorities- he can, the Sephardic authorities say that the tenant is not obligated to pay. 32. When does one make the bracha (blessing)? One bracha is said over all the mezuzot in the house at the time they are affixed. If the mezuzot were removed for inspection and returned many hours later, the bracha must be repeated. If they were taken down and returned shortly, there is no need for a bracha. 33. Does an opening with an arch at the top require a mezuzah? Yes, every doorway requires a mezuzah, provided it has a horizontal lintel. 34. On an aluminum doorpost that cannot have a mezuzah directly affixed to it, can the mezuzah be placed on the adjacent wall? No. The mezuzah must be under the horizontal lintel. If the wall is thicker than the doorpost, the mezuzah can be placed in the empty space in the doorway, a handbreadth away from the entrance. 35. Why is it impossible to correct a flaw or defect in a mezuzah or in tefillin? There is a halachic ruling for mezuzot and tefillin which says that they must be written chronologically. This means that the writing has to be done in the proper order, as it appears in the Torah, letter by letter. Therefore, a substantial correction may not be made. Such a correction would entail writing out of sequence and therefore invalidates the writing. This type correction cannot be discerned in a routine checkup. 36. My mezuzah was pronounced invalid, what must I do? 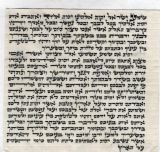 An invalid mezuzah must be put in shaimess (a repository for old Judaic papers). Usually these facilities are available in a shul (beit knesset/ synagogue) yard. In order to prevent resale of an invalid mezuzah, it should be ripped between the lines. 37. 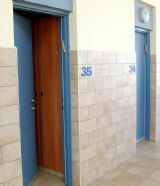 Can doorways in a residence be left bare for a period of time while the mezuzot are being checked? Yes, but one mezuzah must be left at the main entrance. 38. 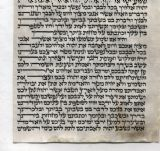 What’s wrong with a printed mezuzah? There is a mitzvah to write the mezuzah on parchment “You shall inscribe them on the doorposts of your home”, writing is not printing. The writing is done in stages by human hands, piece by piece, letter by letter. Printing positions a complete letter in its place. Therefore, a printed mezuzah is not kosher.